So, God provides an amazing deliverance for the Israelites from the slavery of Egypt. The Promised Land is not far away…it’s less than two weeks of walking to get to Israel from Egypt. But God leads them another “roundabout” way. Why not just go directly by the shortest route? We are told the reason in Exodus 13:17-18: “When Pharaoh let the people go, God did not lead them on the road through the Philistine country, though that was shorter. For God said, ‘If they face war, they might change their minds and return to Egypt.’ So God led the people around by the desert road toward the Red Sea….” The Lord knew the hearts of the people…and the road ahead. He graciously steered them away from hard conflict because they were not ready. Their faith was weaker than their fear! I wonder how many times we could have experienced swift and powerful victory, but we were too immature and too fearful to walk it out. Fear is a big deal which often “freezes” our faith and makes us go the long way or, even worse, makes us stay right where we are indefinitely. 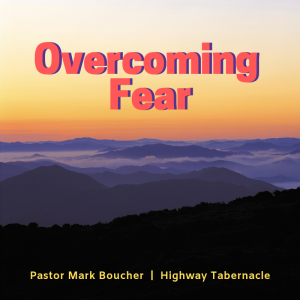 Looking at the Israelites and their journey, we discover characteristics of fear…and how to overcome it. First, we must understand that fear is a mindset which “imagines the worst.” The Israelites, when facing hardships, spoke fear to themselves, saying things such as, “God has abandoned us! We’re all going to die! It would have been better to stay in slavery!” And, just then, we can allow ourselves to dwell on the “worst that could happen.” This mindset leads to a bitter spirit of complaining about our hardships and blaming God. The second crippling effect of fear is how we “shrink” God and make Him less powerful than our problems. Fear says, “God can’t help you…this problem is too big.” So, we magnify our problems and minimize our God. The answer to fear is faith in God! Trusting God, we take steps forward, knowing that He goes before us and has our best in mind. Though we must face spiritual battles on our way to the Promised Land, it beats the “long way” by 40 years!